In extremis: slow, spare and painful. 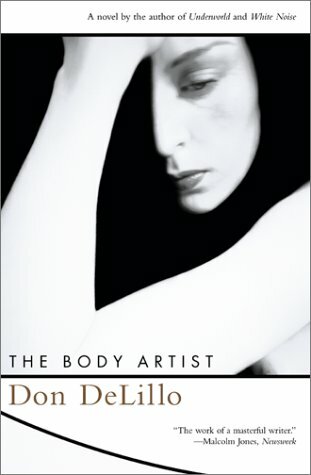 DeLillo’s first novel since Underworld, preceded in 1999 by Valparaiso, his second stageplay. As if marking the distance from its predecessor, it is very, almost impossibly terse; to the point that I find it difficult to consider it a novel(la), and not because of its brevity. Commentators variously describe it as “haiku-like”, “a tightly constructed string quartet”, in an attempt to capture its spareness. But ultimately The Body Artist has nothing to do with poetry. Although DeLillo makes it do things novels don’t do routinely. Much like Lauren Hartke, the protagonist, does with her body. Which brings us to another feature of the book: a wealth of meta-narrative moments, with characters, dialogues and paragraphs working like the novel does as a whole. A fractal-like construction (see, I’m using figures of speech, too). DeLillo’s amazing ability for developing two, even three lines of thought simultaneously over several paragraphs, as though in counterpoint, is here stretched to book length. Ultimately the novella is not so much about death, loss and mourning (which is what the reader gathers from most abstracts) as it is about time and its influence on the self. Perception, both of the outer world and of the self, is also investigated. Oh and I almost forgot, this is a ghost story. This was written by alessandro montagner. Posted on Tuesday, June 11, 2013, at 11:23. Filed under English, LETTERATURA, Narrativa. Tagged Don DeLillo, fantasmi, novella, post modernismo, U.S.A.. Bookmark the permalink. Follow comments here with the RSS feed. Post a comment or leave a trackback.